Until 14 February a small but beautiful exhibition is taking place in the Fondation Pierre Bergé Yves Saint Laurent in Paris: ‘Vivre pour l’Art’, which can be translated by ‘the art of living for art’. It is dedicated to two major figures of the Parisian fashion, two couturiers who both embodied the height of taste in their respective time: Jacques Doucet (1853-1929) and Yves Saint Laurent (1936-2008). Both were also art discoverers and collectors and used to live in beautiful apartments surrounded by the works of art (paintings, furniture, and other decorative objects) they had bought: Jacques Doucet in Neuilly, 33 rue Saint James, and Yves Saint Laurent in Paris, 55 rue de Babylone. The purpose of the exhibition is not to reconstruct the interiors where Jacques Doucet and Yves Saint Laurent used to live but to suggest their atmospheres and through them the art of living and the personality of each couturier. 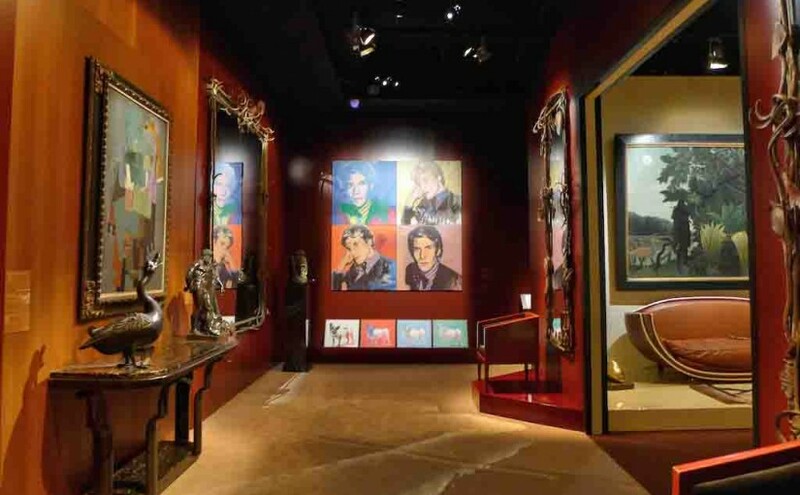 One strolls about five rooms, three dedicated to Jacques Doucet and the last two to Yves Saint Laurent, where masterpieces that both men used to own are exhibited. Some of them are superb and I really appreciated to see them gathered as they used to be in the couturiers’ apartments. Indeed most of them are now scattered in various museums or private collections… and one can believe me, it is completely different to see a painting in a museum and to admire it in this exhibition where one can imagine it in a place to live. 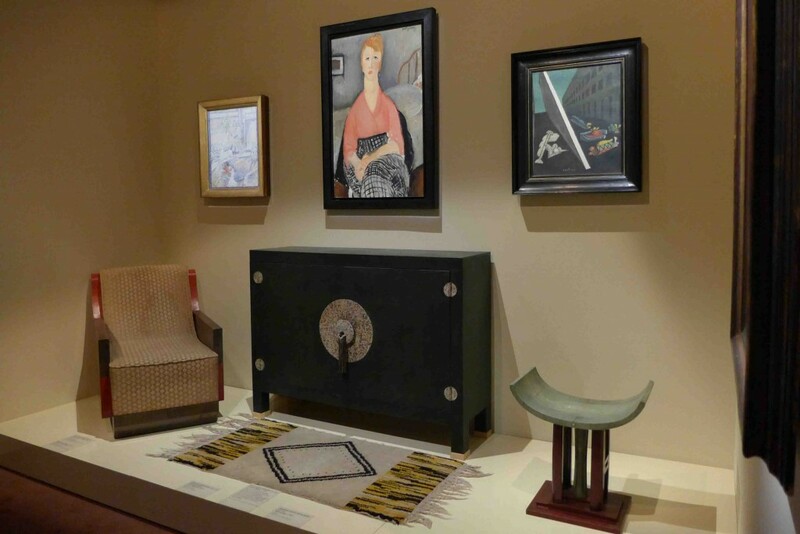 Among my favourites: ‘Portrait de femme dit la blouse rose’ by Modigliani; ‘La charmeuse de serpents’ by Henri Rousseau; ‘Idylle’ by Picabia ; ‘Le danseur’ by Matisse; ‘Le profil noir’ by Fernand Léger,… and all the furniture by Eileen Gray or Pierre Legrain: so beautiful and elegant! The exhibition is not crowded at all and it is a real pleasure to be able to admire very closely the paintings and the pieces of furniture and to feel and imagine how they were displayed in the apartments of both collectors. Unfortunately one is not allowed to take pictures. The two museum attendants are very watchful and I could escape detection only twice: you have to go and visit the exhibition if you want to admire more! Fourty-five minutes are enough… So if you want to take a break while shopping around the Champs Elysées, do not hesitate!